The wait is finally over for Nintendo fans, the new Nintendo 3DS portable gaming console is now on sale. The 3DS brings real 3D gameplay without the use of 3D glasses or other accessories. Besides playing games in 3D, you can take photos in 3D using the built-in stereo 3D cameras as well as watch videos in 3D. There are further hardware improvements over the older Nintendo DS like new input interfaces including a Circle Pad, gyro and motion sensors. The good thing is you can turn off the 3D graphics if you start to feel nauseous. See the Nintendo 3DS hardware specs after the break. 2.4 GHz. Enabling local wireless communication among multiple Nintendo 3DS systems for game play and StreetPass. Enabling access to the Internet through wireless LAN access points (supports IEEE802.11 b/g with the WPA™/WPA2™ security feature). Recommended distance of wireless communication is within 98.4 feet. This can be shorter depending on the enviromental situation. WPA and WPA2 are marks of the Wi-Fi Alliance. When playing Nintendo 3DS software about 3-5 hours. When playing Nintendo DS software about 5-8 hours. Battery duration differs depending on the brightness setting of the screen. The information regarding battery duration is a rough standard. It can be shorter depending on what functions of the Nintendo 3DS system are used. 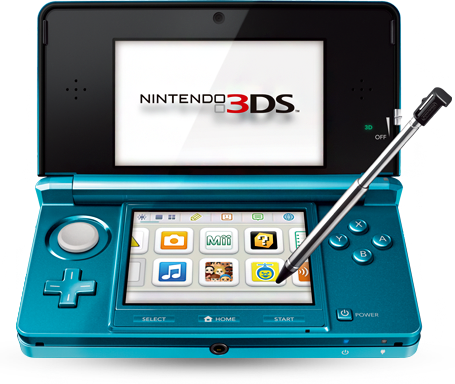 The Nintendo 3DS is available in Cosmo Black and Aqua Blue for $249.99.